The FunMouse gestures tab is where you can edit and create new application specific mouse gestures. Mouse gestures make it easy to perform various tasks like for instance minimizing or maximizing an application without first having to move the mouse pointer to the minimize and maximize buttons by simply holding in the right mouse button and performing a pre-defined mouse movement. 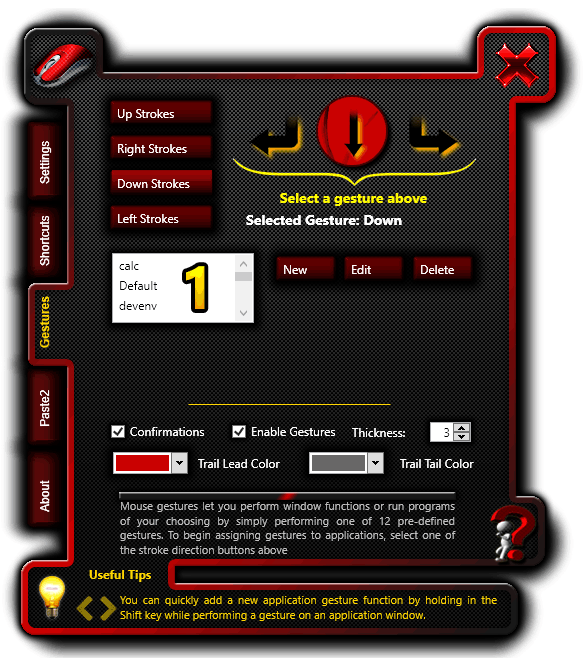 Unlike other mouse gesture applications FunMouse only have 12 pre-defined mouse gestures. This has an advantage over other such programs in that users only have to learn 12 movements which can be used over and over again to execute different actions for different applications. These 12 gestures are further divided into 4 directions: Up, Down, Left & Right gestures. Upon first installing FunMouse some default mouse gestures are created which the user is free to edit to perform other functions. [Win Key + m] which will minimize all windows to show the desktop. then every time the user draws a downward mouse gesture with the right mouse button held in, the desktop will be shown unless the active application has another shortcut assigned. When a user draws a downward mouse gesture with the right mouse button held in, FunMouse will first check to see if an application specific shortcut is specified, and if not, will execute the default shortcut. So if we continue to use the first example we created above for the default entry, it means the desktop will be shown every time the user draws a downward mouse gesture with the right mouse button held in, except when drawing on windows notepad, in which case the notepad window will be maximized. Continuing with our example, if the user sets the global entry to lock the computer the following will happen. The desktop will be shown every time the user draws a downward mouse gesture with the right mouse button held in, except when drawing on windows notepad, in which case the notepad window will be maximized. If QuickSwitch is invoked, the computer will be locked when the user draws a downward mouse gesture with the right mouse button held in, overriding any default shortcuts as well as the application specific shortcut we created for notepad. Global entries override all other entries (Default & Application specific), no matter which application is currently active. Global entries will only be executed when QuickSwitch is invoked. The "Default" & "Global" entries are hard coded entries added by FunMouse and can not be deleted. It can only be edited. To quickly see what actions are assigned to the active application, hold in the right mouse button like when you do when you want to perform a gesture without moving the mouse. After a second 4 preview windows will appear indicating the actions when performing gestures on the active window. QuickSwitch can be invoked by assigning it to an extra mouse button function, a mouse gesture or a hotspot shortcut. Once QuickSwitch is invoked, the image on the left will appear in the top left corner of the user's screen for 2 seconds. Any mouse gesture performed while QuickSwitch is active will execute the global entry for the mouse gesture performed. Clicking the "New" button will start the process to create a new application shortcut, with 3 text commands being displayed. From here the user can either cancel creating a new application gesture, browse for an application or select the application from a list of running processes. The easiest, which also happens to be the quickest way to create a new application mouse gesture is to hold in the Shift key on the keyboard while performing a mouse gesture. Performing a mouse gesture with the right mouse button held in while pressing the Shift key will open the FunMouse settings program with the correct gesture selected and most of the required fields already filled. From this point on the procedure for creating & editing shortcuts are practically the same. 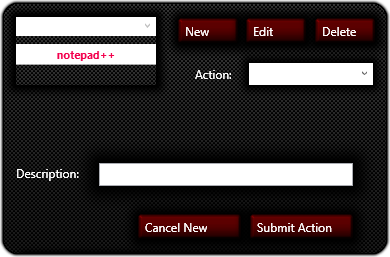 Once a new application is specified or an existing shortcut in the listbox is selected the interface will change to reveal an action drop-down box (See image below) and other fields. When a user select Hotkey as the Action type , a new button marked "Menu" will appear obscuring the Action text next to the drop-down box. Click this button to display a menu with general hotkey combinations. Selecting one of the menu options will fill most required fields for creating a hotkey shortcut. When entering manual keyboard combinations, after the user has clicked the "Begin Capturing" button the windows operating system will not receive any keyboard input (except some security combinations). To return keyboard input back to the operating system, the user HAVE to click the "Stop Capturing" button. When Enable Gestures is unchecked, FunMouse will not listen for any mouse gestures or draw a gesture line when a gesture is performed. This is the equivalent of trying to perform a mouse gesture while FunMouse is not running. Thickness refers to the width of the line being drawn whenever a user draws a mouse gesture with the right mouse button held in. Click the up or down arrows to change the width of this line. Click on the color drop-down boxes to pick the colors in which the line being drawn start and end with.